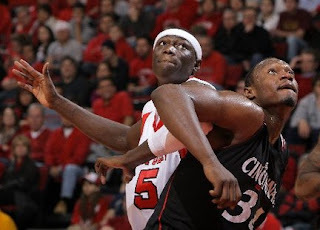 The Cincinnati Bearcats used 17 points from Deonta Vaughn and a tough defensive effort down the stretch to beat the Rutgers Scarlet Knights 65-58. It was not a pretty game by any means, but 2-0 in the Big East is 2-0 in the Big East. I once again was close to nailing the final. I predicted 67-59 in the preview. I was close in the UConn game as well. If only I had bet on these games, then I would have something to show for it. More detailed recap coming tomorrow.